Team members Jenny Nixey, Hayley Squance, Ngaio Beausoleil, Rachael Stratton, Richard Kuipers von Lande and Fred Pauwels. The University’s new Veterinary Emergency Response Team will travel to Christchurch on Sunday to assist in caring for animals following Tuesday’s earthquake. Team leader Hayley Squance says the Christchurch Society for the Prevention of Cruelty to Animals and the city council’s animal control services today requested assistance to deal with domestic pets in the city. 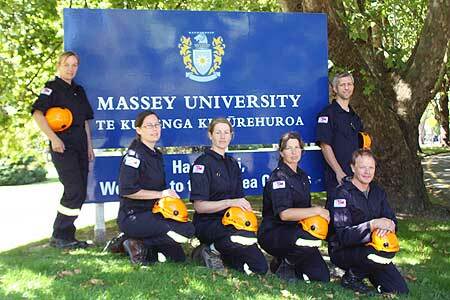 Four members of the team leave for Wellington tomorrow for a briefing before travelling to Christchurch. Ms Squance expects they will go door to door checking for animals that may need assistance. She says while there is no major animal emergency as such, the team will assist in assessing the needs of animals in the city. The team’s mobile vet clinic is not required at this stage and the team will work out of a local clinic. Based at the Institute of Veterinary, Animal and Biomedical Sciences at the Manawatu campus, the team comprises veterinarians, veterinary technologists and vet nurses with expertise in companion animals and livestock.